This morning I took the girls to get x rays to assess their bone age. It's all part of the Big Stressy Stuff that makes me want to do all the daytime sleeping and nighttime binge eating. ANYWHO. After gathering our requisite $100 worth of hodge podgery we may or may not need, (in bulk even) I was kind of glassy eyed, and glancing toward the Diet Coke fountain. 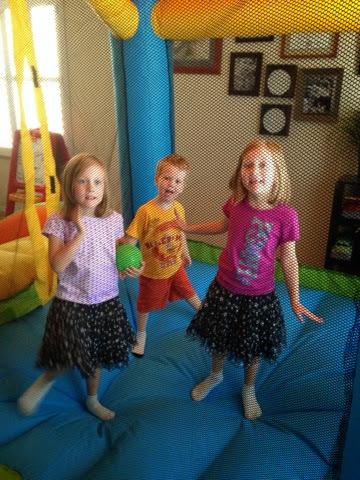 The kids caught sight of a bouncy house and started to point & shout. We were in the check out line at this point, yet something clicked in my mind. Something about how blasted hot it is, how swimming is really the only acceptable form of physical activity and GEEZ am I tired of THAT nonsense. So we left the safety of the check out and just went over "to look." It looked pretty small-ish, as I imagined its size in comparison to our playroom. (It's a brilliant idea to get cavalier about measurements & dimensions when making major purchases) Yesssss. And really, how much is my sanity worth? ALL THE DOLLARS, I SAY. I texted The Husband to see what he thought, since he took longer than five seconds to respond I took it as compliance & dragged that sucker into the cart. 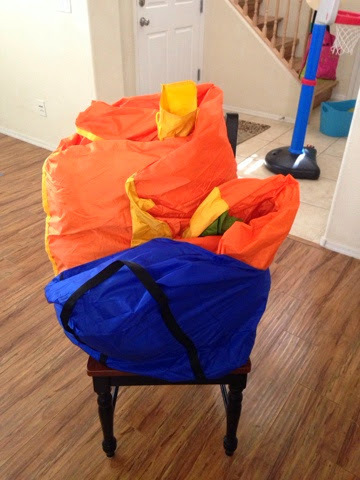 Basically this is how one can easily lose an entire playroom plus most of the dining room. That baby is quite large. Which, duh. In a huge warehouse, of course scale can be deceiving. I was confident that we had a ton of extra floor space, (which I still maintain we do!) 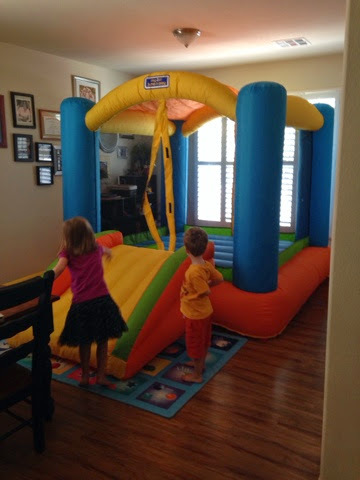 It's just all taken up by bounce house now, and the dining table is backed up against the wall. BUT NO MATTER! It made the perfect babysitter, and I intend on working her hard, maybe even daily. I'm just so DARNED EXCITED. YAY ENDORPHINS! BUY ALL THE THINGS! Then I tried to put it back in the itty bitty "bag" that it came with and HAH, to you, sirs at SportsPowerLtd. HAH. Still, I'm thrilled. I may have texted my mom a slightly vague "just bought a bouncy house for the kids!" And she CALLED ME, within a minute, probably worried about a case of the body snatchers. I also believe she may have said something like "I can't wait to tell your FATHER about this." Which made me both laugh until I nearly wet myself and then question the sanity of my recent purchase. Nothing like setting up a giant inflatable in your front room to get your blood pumping in the afternoon! Hopefully the children will be slow to catch on that when Mommy is stressed out, they can pretty much ask for, and receive nearly anything. its the NEST babysitter!! we got a foam mat at home depot for not too much and just put it around the landing sides and it worked great- we have tile though- and it truly is the BEST!! wit no backyard to have sprinkler fun we use that puppy like no other! good work mama! That's amazing! You really are the best mom! Man, anything to beat this ridiculous heat! Oh man! One of Espen's friends has one of these, and I ask myself if we could fit one in our house every single wintry day they play on the thing. So far the answer has been no. We will see.